The deadline for applications has been extended to 23.45 on Sunday 11 November 2018. Chamber Choir Ireland and the Contemporary Music Centre announce the third year of Choral Sketches, with mentor composer Tarik O’ Regan. Chamber Choir Ireland is the country’s flagship choral ensemble and national chamber choir under the internationally celebrated and multi-award-winning conductor Paul Hillier as Artistic Director. The Contemporary Music Centre is Ireland’s resource organisation for contemporary music, documenting, developing and promoting new music from Ireland at home and abroad. 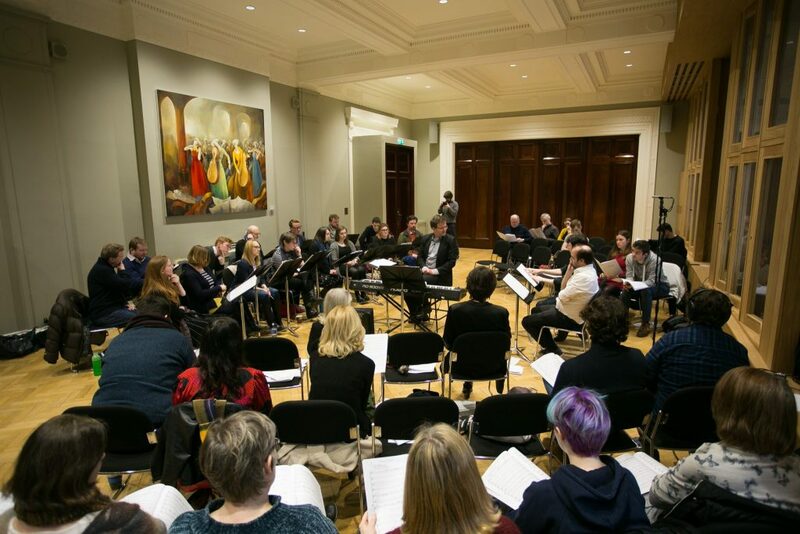 Following the success of the Choral Sketches projects in 2017 and 2018, Chamber Choir Ireland and CMC will renew their partnership in 2018/2019, to present this unique professional development opportunity for composers who wish to develop their skills in writing choral music with mentoring from renowned composer Tarik O’Regan. The purpose of the Choral Sketches initiative is to provide a creative and open environment for composers to deepen their experience in writing for voices in a choral context. The project is open to composers registered with the Contemporary Music Centre. Chamber Choir Ireland and the Contemporary Music Centre are now seeking expressions of interest for this initiative. Would you like to apply for the Choral Sketches project? In order to make a submission, composers must submit the following by email to submissions@nullcmc.ie by 9am on Tuesday 30 October 2018. A short proposal outlining how Choral Sketches will enable you to explore your compositional ideas and develop your skills. Please provide this in pdf format along with your contact details. Two recent completed scores in pdf format (not excerpts) and mp3 recordings or electronic realisations of each score. Please ensure that both scores and mp3 recordings do not have any identifying features. Please note – the selection process for Choral Sketches 2018/2019 will be anonymous, any scores or recordings with any identifying features may preclude the applicant from consideration by the panel. Include your name and contact details on the email only. Composers chosen to participate will be informed during the week beginning 12 November 2018. Participating composers may apply for CMC travel bursaries. Composers who were selected to participate in Choral Sketches 2017 and 2018 are ineligible to apply for Choral Sketches 2019. There is no age restriction for applicants. The completed works which develop from the sketches are embargoed for public performance until after the subsequent performance reading by Chamber Choir Ireland in Autumn 2019. Submissions are checked for eligibility by a member of CMC staff and each submission is acknowledged. Submitted scores and recordings are then presented to the selection panel without the applicant’s name, titles of works, or other identifying features. The selection panel includes the mentor composer, Tarik O’ Regan and Chamber Choir Ireland’s Artistic Director, Paul Hillier. For queries on Choral Sketches, contact – Keith Fennell, CMC Production Co-ordinator.